Zack Greinke pitched a gem through six innings, but he ran into trouble in the seventh. Marcell Ozuna tied it up out of nowhere with a bomb of a homer to left, which is what hitters like him do. Then two consecutive singles and a walk setup a bases loaded situation and Scott Van Slyke heroics. It was a really really really close play, but it seemed like he was out by literally about an inch, and it wasn’t something that was gonna be overturned. All said and done, Greinke pitched seven innings in 91 pitches, surrendering just the single run, and gave up six hits and two walks while striking out five. Asked by @THEREAL_DV if Dee Gordon's speed was his focus pregame Greinke said,"Not too much, actually. He gets caught more than most people. The Dodgers themselves didn’t have much luck on offense though. They scored their first run on a fielder’s choice grounder by Justin Turner that scored Howie Kendrick in the bottom of the fourth, and their second came from a Joc single (!!!) up the middle to plate SVS. The team did have other chances to score, like in the bottom of the fifth with runners on the corner and one out. Jimmy Rollins, who can’t buy a break, smoked a liner to right that Giancarlo Stanton made an amazing play on. Sac fly should’ve been the worst-case scenario, but instead Joc Pederson got caught napping and was doubled up at first before SVS could score from third. Reliever Adam Liberatore and Chris Hatcher did their job to shut the door in the eighth, but then Yimi Garcia proved he was human. Garcia allowed a go-ahead two-run homer to Christian Yelich and left with the bases loaded for J.P. Howell, who got Dee Gordon to fly out to left. The Dodgers responded with a rally in the ninth, with a Yasmani Grandal walk and Andre Ethier working a soft single over second base. Is it nice having an 8th hitter with a .971 OPS? Yes, yes it is. How good is it? He can leave Clayton Kershaw hanging. 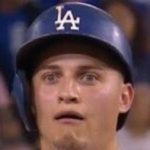 No Yasiel Puig, no Hyun Jin Ryu, no Kenley Jansen.